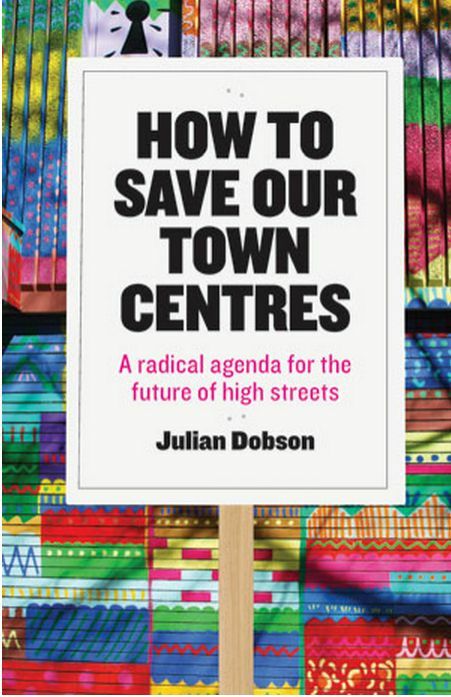 Book review: How to save our town centres: a radical agenda for the future of high streets by Julian Dobson. Policy Press (available here). ‘How to save our town centres’ is an unfailingly positive book. It takes on the challenges, the problems, the issues staring town centres up and down the country in the face, but is always thinking about what we might do about them, presenting the shift we need as “the transition from ‘me town’ to ‘we town'”. It is bold and ambitious in its solutions, yet it all makes sense. “In the context of the ‘old economy’ of concentrated ownership, standardised products and places that look increasingly alike, these new producers and consumers may be swimming against the tide. But against all the odds, they are making headway. It’s time to raise a glass to the new economy, because it’s the best hope for our high streets”. “The notion that every town and city can prosper in competition with neighbours pursuing the self-same strategy of debt-fuelled development and the accumulation of bigger and brighter retail space defies credulity; there will always be losers, and some will lose spectacularly”. He challenges the way in which town centres are developed, land ownership, and how most development serves distant investors and imagination-bereft and economically extractive developers rather than local people and what they need from a place. “…the only positive future that governments, retail and real estate experts and financial gurus appear able to envisage for our towns is one where the wheels of the gravy train are re-greased and the whole shambolic jalopy is set in motion once again, with the same predictable consequences”. Among the tools he recommends that would make a difference is a “much more radical extension of the right to reclaim land”, which would kick in if a site or property is left unused for over a year, as well as a ‘Right to Try’, whereby communities could use empty buildings to try out new uses for them. At the heart of his solutions is the idea that owning property requires a mindset of stewardship, of responsibilities as well as rights. As he puts it, “People who are trying to make a quick buck tend to be poor stewards”. We all know how that feels in the places we live. But all is not lost – the future, as they say, is already here, it’s just unevenly distributed. Across the UK, in the face of appalling development, as he puts it, “local identity is flickering back to life”. Indeed, rather than being something exceptional, working co-operatively to solve problems is our natural state. As he puts it “far from being a utopian fantasy, cooperative attitudes simply need to be stirred from their slumber”. And they are indeed stirring, through a dazzling diversity of campaigns, movements, projects and social enterprises. “There is ample evidence that ordinary people, with determination and support, can affect lasting change and create value both for people who need somewhere to live and for the wider residential and business community”. So what’s the alternative? “The challenge” he writes, “is to create places that work, where people are productive and feel at home, where human beings can flourish as citizens and not just consumers”, places he later refers to as “places of possibility”, a term I had been searching for for some time now. How might we start doing this? He identifies what for him are the key tools needed: “thinking in terms of risk, resilience and restoration”. For Dobson, like Transition, rethinking local economies and how they work is an enormous opportunity. “If we want to assess the real state of our economy”, he writes, “we need to pay less attention to GDP figures that show whether or not we are in or out of a recession, and focus more on our ability to generate wealth intelligently; value it accurately, share it fairly and recycle it effectively”. “The resilience we need to build locally shares the same DNA as the resilience required to address global problems such as poverty and climate change”. “We need an alternative to the Hobson’s choice of unaccountable and unresponsive global institutions and vulnerable, undercapitalised local ones – both of which have proven unsustainable when disaster strikes”. Transition appears regularly in these pages: the Bristol Pound, the Brixton Pound, the NoToCosta campaign in Totnes and Transition Town Totnes’s Economic Blueprint, which he describes as being “not about backwoods isolationism or making do with second-best; it seeks to maximise public benefit by redirecting money that is already being spent”. ‘How to Save our Town Centres’ is a call, like Transition’s REconomy Project and many other great initiatives popping up everywhere, to step up and create the new economy. It is rare to find a book about urban regeneration and local economies that you can’t put down, but this is one. And he even names a chapter after a song by The Clash (“Lost in the Supermarket”, thankfully not “I Fought the Law and the Law Won”). It’s brilliant. I recommend it hugely. Buy copies for everyone on your local council. Buy it for everyone in your Transition group who are trying to figure out how best to impact the local economy for the better. It contains the passion, the ideas, the approach that we will need if we are to bring our High Streets back to life. You can order the book direct from the publisher here.